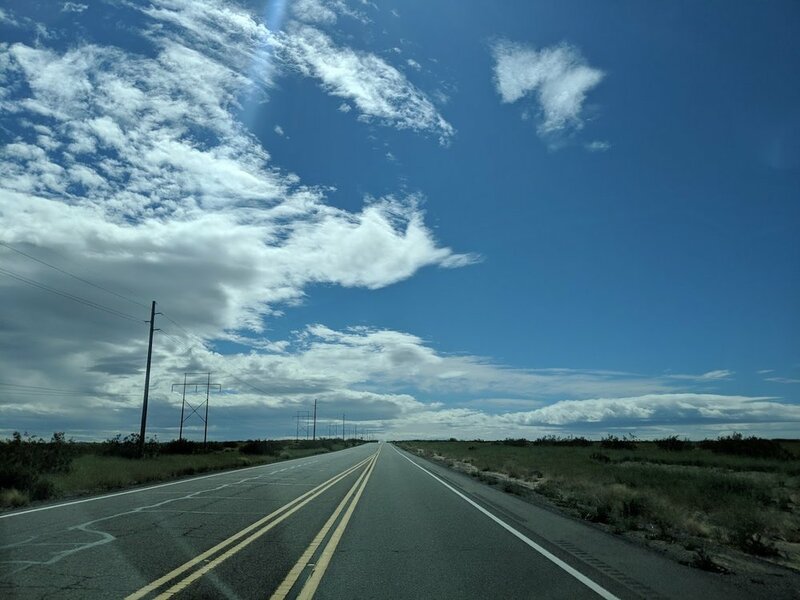 Arizona Road Trip 2019- Parker to Phoenix ( London Bridge in Lake Havasu) — Always Packed for Adventure! We woke up early and enjoyed our included breakfast buffet at the Hampton Inn. Although we were told that the hotel was filled to capacity, breakfast was surprisingly quiet. It also included more hot options than the usual Hampton Inn breakfast. The Parker Hampton Inn is not located in the nicest area, but it was definitely a cut-above average for the hotel brand. Dan hates to backtrack on road trips, but we decided that it was worth it to check-out The London Bridge in Lake Havasu. 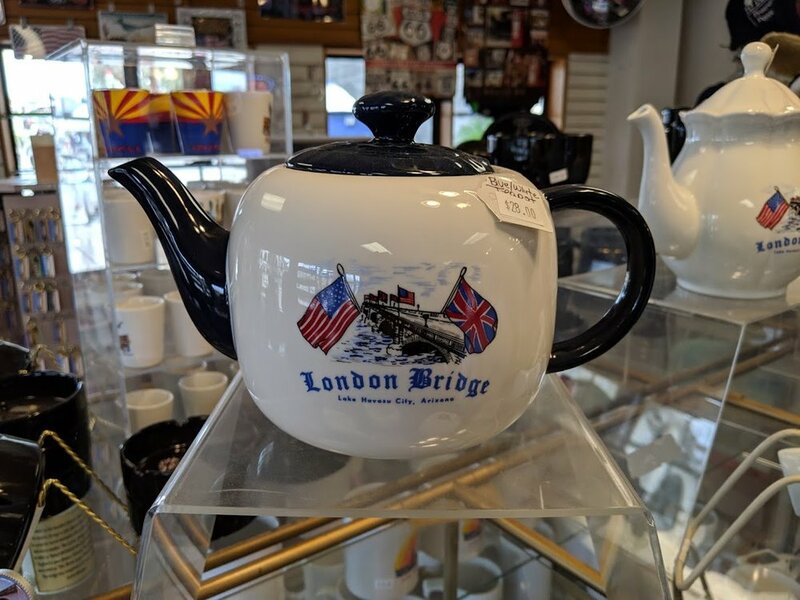 In 1968, the city founder of Lake Havasu, Robert P. McCulloch, won a bid to buy The London Bridge and he had it brought over from England, brick-by-brick, to be reassembled in Arizona. The original London Bridge from the nursery rhyme, had been replaced with this bridge in 1831. This “new” London Bridge began to sink and was not efficient for modern living, so the city of London decided to auction it off. 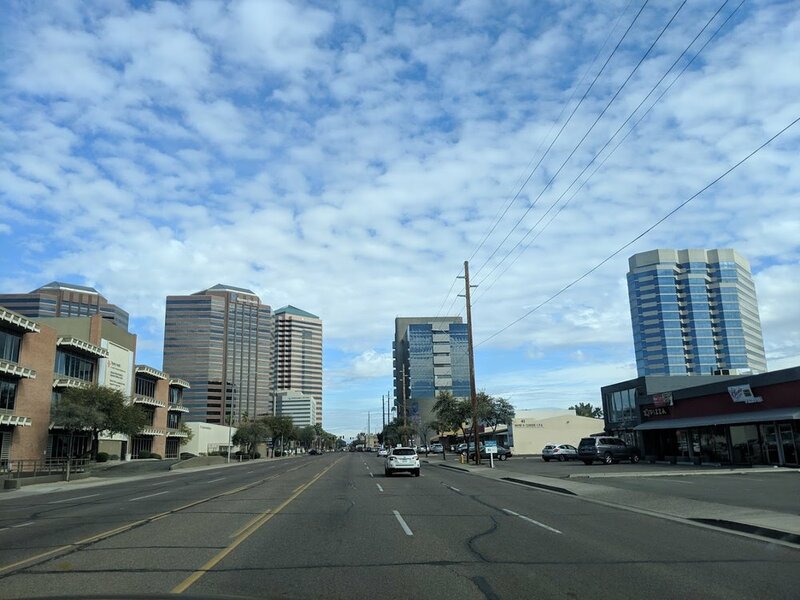 It’s definitely unique to have a piece of London in Arizona and it was just thirty-minutes out of our way, so we had to make the effort to see it. Lake Havasu is a resort town in the desert that is filled with snowbirds in the winter and is known for being the west coast spring break party central. I had visited once before in my early-twenties (not for spring break) and didn’t think much of the area. It was back then, as it is now, kind of a dead town. The London Bridge is one of the main attractions and much is made to promote it. There is even a little tribute to England with lions and red phone boxes. It’s tacky and touristy, but we were delighted. Gone from my first visit, was a British Pub. They need to bring back the pub; My husband wanted a full-English breakfast! Another phone-less, phone box was located near the water, in front of The London Bridge! The overcast weather was perfect for our little piece of London. The bridge had a section covered in love locks. Here is a view from the bridge, showing a few of the many boat rental shops. Posing with “The Dedication” statue. A visit to The London Bridge would not be complete without a stop at the gift shop. We did buy our obligatory fridge magnet, but we skipped the teapot. We spent about thirty minutes at Lake Havasu. It was just enough time to enjoy the bridge. If the weather had been nicer, it would have been great to rent a boat and get out on the lake. While I don’t think I’d come back to Lake Havasu for a full vacation, it is worth a short visit. It was a quick backtrack to Parker, where on the drive we enjoyed the views of mountains, rivers, and a million RV parks. I cannot emphasize enough the volume of RV parks. It was staggering. In Parker, we made a quick pit-stop at a Walmart to buy “bug resistant” windshield wiper fluid. The bugs were too mighty for the special fluid and we were battle guts the entire trip. 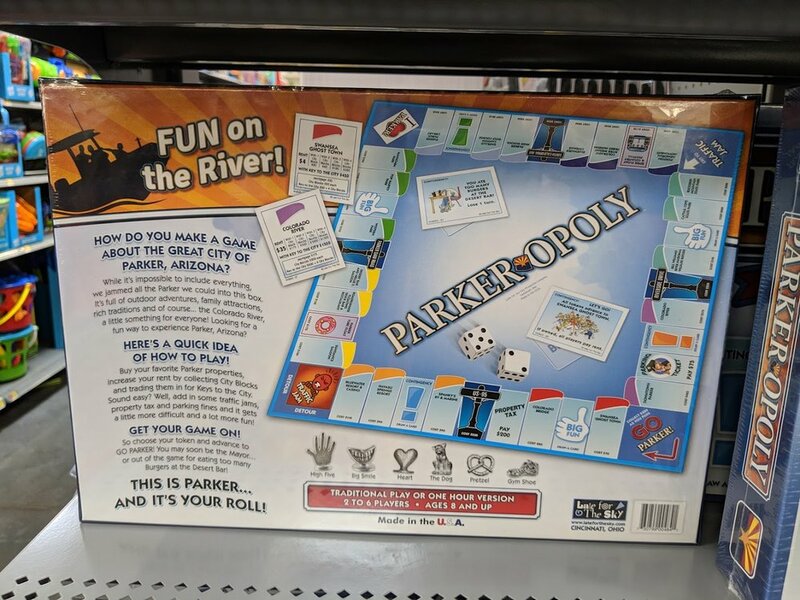 We did see a fun display of Parker Monopoly at Walmart. Perhaps we didn’t spend enough time in Parker to really appreciate it, but we were very surprised that the town had its own monopoly game! On the drive to Phoenix, the sun started to come out and the cool weather melted away. Nature knew that we were ready for pool time! 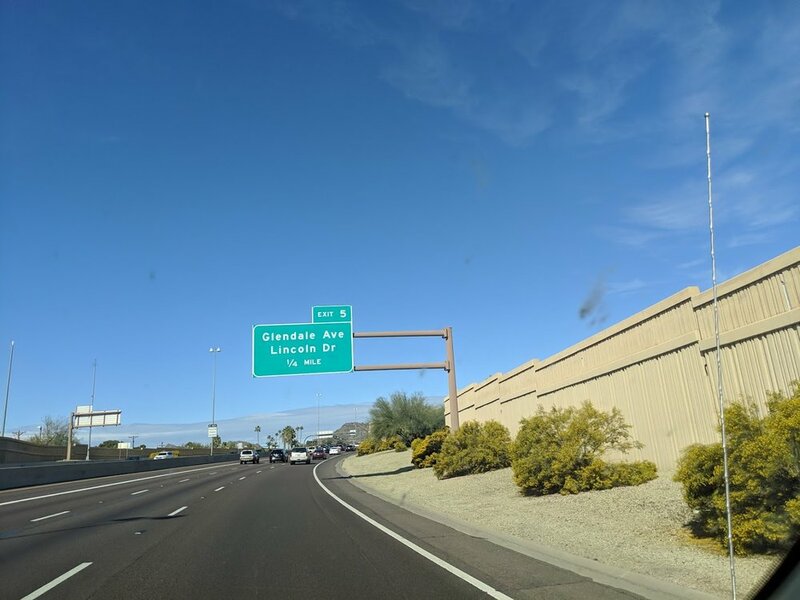 A little less than three hours later, we reached Phoenix! We drove near downtown, but not through it. A few exits from our hotel, I saw a familiar name: Glendale Avenue was the major cross street for my childhood home in Glendale, California! In my next post, I will review our stay at an amazing resort in Phoenix, Arizona!